Seriously, I can't really believe that it is the end of yet another month already! As it is the end of the month it is time to update my Stash-busting efforts for the month of March, and also show you my finished FOs which I missed out on last week. First I have Jas's Socks. 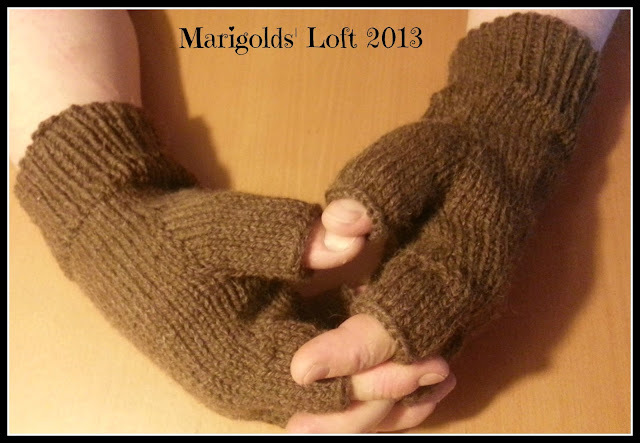 These were a great, quick knit, but turned out to be rather on the big side of things. They are pretty loose around the wrist and need taking in on the hands themselves - no, I know what you are thinking - I won't be ripping back - no way!! 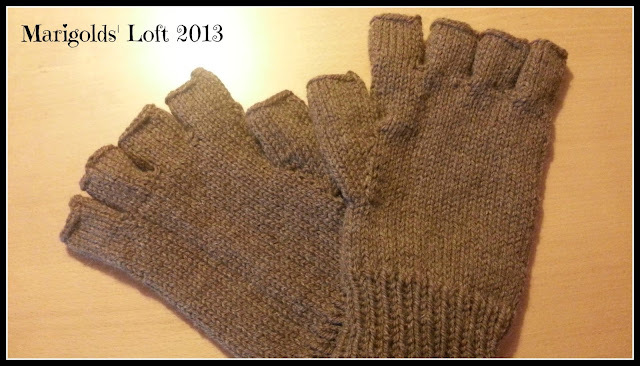 I am busy trying to put together a pattern that will be better suited to his hands, and once it is done, I will share it with you all. Gives me a new Stash-Busting total of 1244g! I will be sharing this over at Tamis, Linda, Linda and Andrea today. Have a super Weekend and a Happy Easter. wow! You have made excellent progress. Congrats! Have a super Easter and thanks for visiting. Da hast du doch ein schönes Ergebnis für den März! Ich hoffe, es geht dir wieder gut und du hast dich erholen können. Habe ein schönes Osterfest mit deiner Familie! Ich fasse es nicht, dass es bei uns wieder schneit. Aber da müssen wir wohl durch. LG Sabine. Dankeschön :) Ich wunsche dir und deine Familie auch ein Wunderschönes Osterfest, und hoffe das es bald wärmer wird! Wir haben heute Nebel und Regen, kann sein das es wieder schneit :( Ich möchte aber im Garten! Stash busting! What a great concept, will definitely need to do something like this myself. Love those socks, they look so soft, warm and toasty. 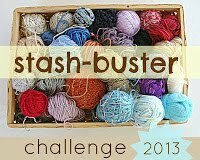 If you want to join in the Stash-Busting Challenge, you can follow the link by clicking on the button at the top of the post. I am not sure if you can join at this point in time, but it is worth asking :) Would be nice to have you join in! Nice projects, especially the socks with the cable pattern are beautiful. Nice and warm to wear. Happy Easter. Thank you so much. I hope you had a lovely Easter. Oh boy! Looking at your stash busting total makes feel slightly ashamed, I haven't made nearly as much progress this year, time to step up! I can't actually say why I am so driven to finish this stash, I guess I feel bored looking at it and so I want it out of my hair, but don't feel bad, I definitely am generally not like this! I just look at your stash tallys and am in awe! You are so good about sticking to the project goals you set. 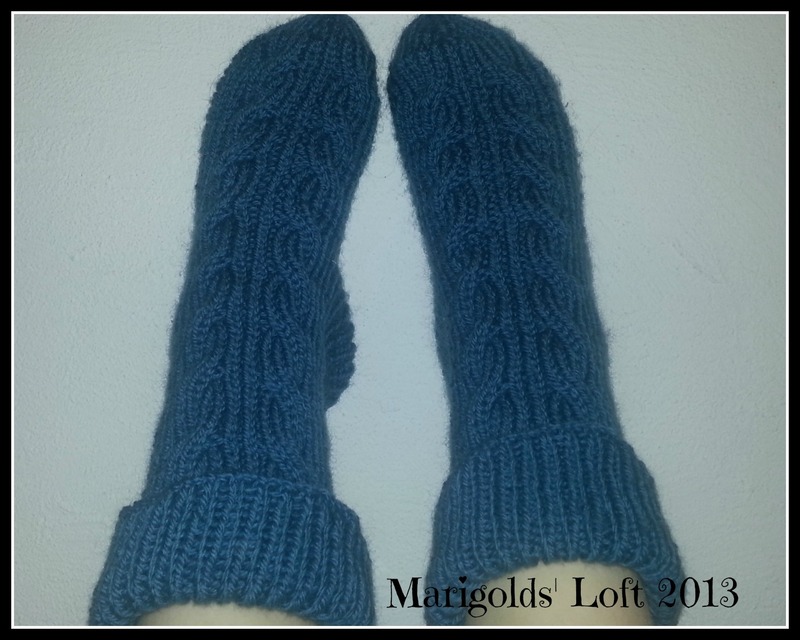 Ooooh -- I love the texture on those socks! They are extremely warm I must tell you, so nothing to wear in spring! LOL! BEAUTIFUL! I must do a stash-buster next year...maybe I'll set myself a challenge for next month. It is nice to feel like I am accomplishing something, and each time I look in my stash drawer an see the stash diminishing it does feel pretty good I must say. At least the fishmoths will have less to eat this year LOL!! Thanks for visiting, I will head over there now, thanks for the invitation. Hope you had a super Easter. Thank you so much, I hope you had a fab Easter Weekend. Thank you and thanks so much for visiting. Lovely projects! My favorite are the gloves. Those socks rock! I love the utilitarian look of the gloves. They make me want to get out in the yard on these still chilly days and get some work done.